The new Alfabiotech SUPERTUFF hose series is extremely flexible and offers up to 50% better bend radius compared to SAE 100R. The synthetic rubber tube material is oil resistant and compatible with biodegradable hydraulic fluids. Depending on the type selected, four or six high tensile steel wire reinforcement will be used. The cover is abrasion, ozone and hydrocarbon resistant synthetic rubber. 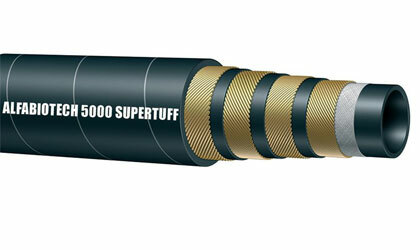 Special “Supertuff” cover provides excellent abrasion resistance and long service life in heavy duty applications. Meets flame resistance US MSHA IC-152/16. Developed to withstand very demanding conditions, very high performance in pressure, pulsing and flexing. Click here for more info.